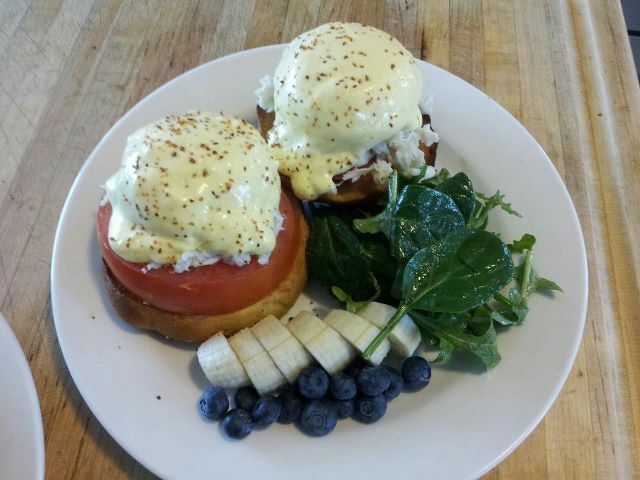 Happy National Eggs Benedict Day!!! Today is National Eggs Benedict Day. Eggs Benedict is definitely one of my favorite breakfasts. I happen to love my eggs poached and still runny. The creamy yolks to quote the movie Julie and Julia are like “cheese sauce.” I do get bored with the traditional version however so I started messing around with the recipe and came up with the following. I served it about a month or so ago. The only thing traditional about it was the poached eggs and the Hollandaise Sauce. A quick note about poaching eggs. You can poach them the old fashioned way in a pot of gently simmering water with a hint of vinegar in it, but that can be really tricky and very time consuming. My preference is to use an egg poaching pan, which you can get at most high end kitchen supply stores. It makes perfect little poached eggs that are all uniform in shape and size. To keep eggs warm if you plan on doing a bunch of them, place the poached eggs in a bowl of warm water until you are ready to serve. This keeps them warm, but stops the cooking process so they don’t get overdone. Also, I’m a Hollandaise Sauce snob. There is no place for a packaged mix of Hollandaise in my book, especially because many of the packaged mixes are not gluten free and have numerous fillers in them including a ton of sodium. It is extremely easy to make and nothing replaces the real thing. I use good quality cage free eggs that I know are fresh so there is no concern about salmonella. Crab Louie is a sauce made with crab, asparagus and Hollandaise that often goes over a filet or a chicken breast. In this case I decided to put it over my poached eggs for a new and improved version of Eggs Benedict. If you do not like crab or have an allergy, just do the roasted asparagus with the Hollandaise and skip the crab part. Instead of english muffins I use home baked rolls which are much heartier and absorb the creamy eggs and sauce really well. Place yeast, 1 tsp sugar and lukewarm water in a large bowl. Make sure the water is at the proper temperature or the yeast will not be activated properly. Allow to stand in a warm place for 10 minutes or until the yeast becomes frothy. Add salt, sugar, oil and flour and knead until the dough is smooth and not sticky. Cover with plastic wrap and allow to proof for 2 hours in a warm place. Grease a baking sheet with cooking spray or more oil and divide the dough into 10 equally sized rolls. Allow to proof for an additional hour. Preheat oven to 375 degrees. Bake for 20 mins. Allow to cool completely before using. Place egg yolks, water, lemon juice, salt, pepper and nutmeg in a large measuring cup. Puree with an immersion blender. Slowly add hot melted butter, pureeing with immersion blender until the sauce is light golden yellow and thick. If sauce begins to separate, simply reblend. Place asparagus on baking sheet and drizzle with oil. Season liberally with salt and pepper. Toss to coat evenly. Place in a 375 degree oven for approx. 15 mins or until the asparagus are just cooked through, but still crisp. Place one roll on each plate. Top each half with tomato slice, then asparagus, then poached eggs, then garnish with crab meat and finally a dollop of Hollandaise sauce. Garnish with a dash of Paprika. Serve with fruit, bacon or sausage and/or greens tossed in a light vinaigrette.